Enjoy recreation amenities such as bicycles to rent or take in the view from a terrace. Additional features at this hotel include complimentary wireless Internet access, concierge services, and a television in a common area. Make yourself at home in one of the 80 air-conditioned guestrooms. Conveniences include desks and blackout drapes/curtains, and housekeeping is provided daily. This family hotel, located on the beachfront, offers 71 rooms of different types: single, double, studios and one-bedroom apartments. It has been completely renovated in 2015. Featuring outdoor and indoor pools and a spa with hot tub, Hotel Es Port is located 200 metres from Soller Port town centre. Free WiFi is available in public areas and there is a parking on site. Each room is air conditioned and includes a seating area with a desk. There is also a flat-screen TV with satellite channels and a minibar. The private bathroom offers a bath tub and hairdryer. Some rooms also have a balcony. The hotel has a restaurant and bar. The garden features palms and a massage service is available upon request. The spa includes a hot tub, temperature-controlled pool with water jets, sauna, Turkish bath, and different showers. There is also a massage service and beauty treatments available for an extra charge, as well as 3 tennis courts. Soller Beach is 250 metres from the property and Sea Museum is 400 metres away. There is a bus stop right in front of the hotel. Treat yourself with massages, body treatments, and facials. You can take advantage of recreational amenities such as an outdoor pool, a sauna, and a fitness center. This hotel also features complimentary wireless Internet access, concierge services, and gift shops/newsstands. Make yourself at home in one of the 38 air-conditioned guestrooms. Complimentary wireless Internet access keeps you connected, and satellite programming is available for your entertainment. Bathrooms have showers and hair dryers. Conveniences include safes and desks, and you can also request irons/ironing boards. This small and comfortable hotel provides a family atmosphere, set in an excellent location in the bay of Puerto de Sóller. The hotel is situated in Playa d'en Repic's pedestrian area, and is right in front of the sea. Palma Majorca Airport is 3.5 km away. This fully air-conditioned beach hotel comprises a total of 21 rooms and offers a lobby with 24-hour reception and check-out service, lift access, a hotel safe, TV room, Internet access, a panoramic restaurant with a terrace, a café and a bar. Further facilities include: laundry service, dry cleaning service, hairdressing and beauty salon, bicycle hire, car rental, tourist information point and a fax photocopier. Smoking is not permitted throughout the hotel. The rooms all come with a double bed and an en suite bathroom with a bathtub, hydro-massage shower, WC and hairdryer. They also offer a safe, satellite TV, direct dial telephone, radio, Internet access, minibar, wake-up service, bathrobe, fridge and a desk. Air conditioning and heating can be individually regulated. Disability friendly rooms and non-smoking rooms are available. The hotel provides a sauna, spa and Jacuzzi and there is also a masseuse available. This excellent location offers guests a wide variety of activities, such as mountain excursions (with or without guide). It is possible to go cycling or play tennis or golf (fees apply). Lovers of hiking will enjoy the well-marked hiking trails which extend over 120 km and which offer varying levels of difficulty. Guests may also choose to go water skiing, motor boating, diving, wind surfing, sailing, rowing or pedal boating (fees apply). 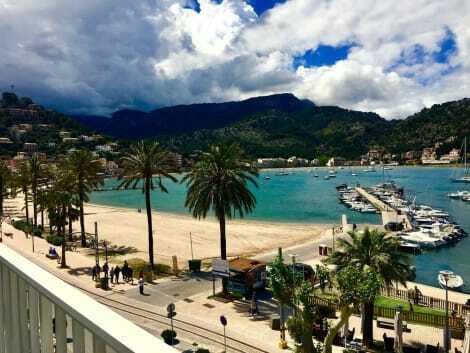 This attractive hotel is situated in the tourist centre of Puerto de Sóller, directly on the beautiful beach. An abundance of shops and entertainment venues are located in the immediate vicinity. Located on the edges of Playa d'en Repic, both the centre and the harbour are just 500 m away. The nearest tram stop is only a few steps away. The family-friendly hotel was built in 1985 and completely renovated in 2002. The hotel is made up of a main building with 4 floors as well as a neighbouring building with 2 floors. Guests are offered a total of 96 rooms including 12 singles and 84 doubles. The facilities include a lobby with a lift, a 24-hour reception, a hotel safe, a currency exchange desk, Internet access, a bicycle cellar and rental as well as a TV room. There is also a cosy café, a hotel bar and an à la carte restaurant with a non-smoking area and highchairs for younger guests. Further services include a laundry service and medical assistance. There are also car parking facilities outside the hotel. All rooms are tastefully furnished and include an en suite bathroom with shower. Moreover, they are fitted with a direct dial telephone, a fridge, satellite/ cable TV, a kitchenette, tiling, central heating, a balcony and a safe. The hotel offers guests an outdoor freshwater pool, sun loungers and parasols. There are also tennis and table tennis facilities, an archery option and a varied seasonal entertainment programme. The nearest golf course is 10 km away. Guests may choose their breakfast, lunch and dinner from the individual buffets. At lunch and at dinner there is also an à la carte option. When you stay at Hotel Aimia in Soller, you'll be by the sea, just steps from Port de Soller and 9 minutes by foot from Playa d'en Repic. This 4-star hotel is 22.8 mi (36.7 km) from Lluc Monastery and 0.8 mi (1.3 km) from Museu de la Mar. lastminute.com has a fantastic range of hotels in Puerto de Soller, with everything from cheap hotels to luxurious five star accommodation available. We like to live up to our last minute name so remember you can book any one of our excellent Puerto de Soller hotels up until midnight and stay the same night.